Welcome to the monthly e-bulletin of the South Asia Media Solidarity Network (SAMSN). The next bulletin will be sent on June 15, 2015, and your inputs are most welcome. 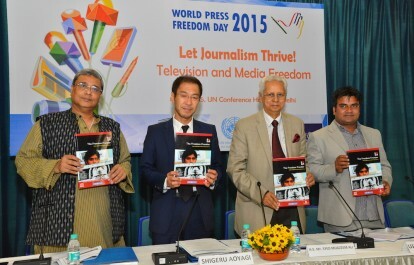 The IFJ and the SAMSN on May 8 released The Freedom Frontier: Press Freedom in South Asia 2014-15 at a ceremony in New Delhi, India organized by UNESCO. 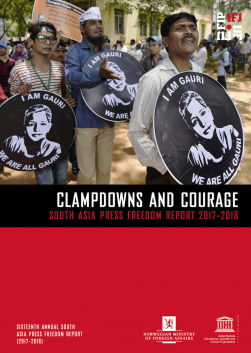 The 13th annual report on press freedom in the region explores the frontlines shaping and thwarting ongoing efforts to build a robust media environment across South Asia. A total of 14 journalists lost their lives across South Asia in the period under review, mostly targeted in attacks with Pakistan the most dangerous country in the world for journalists. 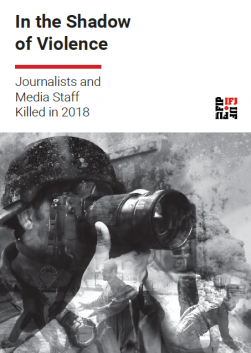 The IFJ said the digital realm represents press freedom’s newest conflict frontline and The Freedom Frontier takes a particular look at the challenges, laws and repressions that are crushing freedom of expression in the digital space. It also explores some of the battles won and some of the mighty battles ahead to stop new laws and censorship that inhibit the flow of information in countries. Read the statement here; download a PDF copy of the report here. Bangladesh is becoming more dangerous for secular bloggers as another blogger is brutally murdered on May 12, 2015. The brutal attack is the third killing of a secular blogger in three months, as freedom of expression comes under attack across the country. Ananta Bijoy Das was killed by an armed group near his home in Sylhet in north-eastern Bangladesh. Das, who worked at a local bank, was attacked by four men with machetes as he walked to work. According to reports, the group chased Das, attacking his head and body with the machetes. He was rushed to hospital but died upon arrival. Das was a well-known atheist blogger in Bangladesh, who regularly wrote for Mukto-Mona (free mind) blog, run by US-Bangladeshi blogger Avijit Roy who was brutally murdered in a similar attack in March in Dhaka. Another blogger Md Oyasiqur Rahman Babu, 27, was also brutally murdered on March 30 in Dhaka. In his writings, Das was critical of fundamentalism and the attack on secular thinkers, as well as championing science. More here. The IFJ has launched a global petition call for all charges of sedition against political cartoonist, Zunar to be dropped and the government of Malaysia to recommit to abolishing the Sedition Act (1948). Zunar, faces 43 years imprisonment, should he be found guilty of sedition. He was charged following a tweet and cartoon he published in February. In addition, over the past 12 months, the Malaysian government has used the Sedition Act as tool of suppressing free speech across Malaysia. Sign the petition here and read more here. The Pakistan Federal Union of Journalists (PFUJ) organised an international media conference for the first time in Karachi, which brought together hundreds of its members from its affiliated unions as well as media professionals, human rights defenders and government officials as well as representatives from IFJ unions in the USA, Canada, Kenya, Kuwait and India. More here. The Free Media Movement (FMM) in Sri Lanka issued a statement to mark the day noting that although some positive initiatives has been taken by the government in relation to media freedom, still old habits of media suppression had been reported form different parts of the country in recent times. Anarticle by human right activist Ruki Fernando outlines the status and challenges of freedom of expression in Sri Lanka. In a lecture organized by SLPI and FMM to mark the day, Wijayananda Jayaweera, former director of the UNESCO program for development communications talked in length about requirements for structural changes in Sri Lanka media system. ARTICLE 19 released ‘Freedom of Expression in Bangladesh 2014’ on WPFD, noting the deteriorating situation for press freedom in Bangladesh. Read thereport here. In Nepal, all formal WPFD programs were withdrawn following the earthquake that struck the country on April 25. However, in a statement, the Federation of Nepali Journalists (FNJ) president Dr Mahendra Bista said: Nepali media is facing various challenges and is failed to enjoy Press Freedom and Freedom of Expression, and professional and physical safety of journalists. More here. UNDP in the Maldives organized a panel discussion to mark WPFD, discussing self-censorship in media and the issues and challenges for the country’s media. April was marked with two brutal murders in Karachi, Pakistan. Sabeen Mahmud, a renowned media and human rights activist was shot dead in Karachi on Friday, April 24 as she left an event at her café and art space, T2F in Karachi. T2F had become a mainstay for Karachi activists since it opened in 2007. She was shot four times and her mother who was with her was shot twice when their car was attacked. Mahmud and her mother were taken to the National Medical Centre, but at 9.40pm Mahmud was declared dead. Mahmud was hosting the event, ‘Unsilencing Balochistan’ at T2F prior to the attack. More here. On April 29, former journalist and university professor Dr Syed Wahidur Rahman, also known as Yasir Rizvi, was killed when four unidentified assailants on motorbikes opened fire on his car in Federal B area of Karachi. Dr Rahman was shot five times. An Assistant Professor with the Mass Communications department of the Karachi University, Dr Rahman previously worked as a journalist for 15 years. It is thought that Dr Rahman’s murder was linked to the university’s talk on ‘Baloch Missing Persons and the Role of Society’ scheduled for May 6. More here. Journalist Suman Bomjan confirmed among the lives lost in in the Nepal earthquake on April 25. Bomjan, 30, a sports journalist with state-owned Nepali daily Gorkhapatra, had been missing since the earthquake. His body was recovered from the rubble of his house at the Bhotahiti Galli of Kathmandu on Saturday, May 2. A stringer for the state media for three years, he had earlier worked for Nepal FM and media in his hometown of Makwanpur, where he also chaired the Nepal Sports Journalists Forum’s (NSJF) district coordination chapter. According to NSJF, Bomjan was assigned to cover football matches on the day of earthquake. The earthquake was 7.9 magnitude, and also killed Govinda Prasad Dulal, 58, father of FNJ Central Committee member Madhav Dulal in Kavre district. More here. Meanwhile, the International Federation of Journalists (IFJ) and the South Asia Media Solidarity Network (SAMSN) expressed condolences to their Nepalese media colleagues following the earthquake. The IFJ and SAMSN offered their solidarity to their IFJ affiliates in Nepal whose members continue to work and share news in the devastating aftermath of the quake. More here. Peshawar-based journalist Rasool Dawar, a special correspondent for Geo TV hailing from North Waziristan, left the region stating that he felt insecure after he has been detained in two incidents for hours under ‘extremely torturous conditions’ by the security agencies. In a letter to Geo TV’s CEO and concerned government and non-government agencies, Dawar wrote: “I have been picked up/arrested on two separate occasions for unknown reasons by security forces and kept me in custody under extremely torturous conditions… I am gravely concerned about my safety.” Dawar was first arrested on February 20, 2015 by the Pakistan army and was interrogated for hours blindfolded. On April 14, he was again arrested by police and locked up. More here. On April 22, the District Court of Dhanausha, in south-eastern Nepal, sentenced Umesh Yadav to life in prison for his role in 2009 murder of journalist Uma Singh. Singh was hacked to death on January 11, 2009 by a gang of 15 men in her home in Janakpur. In 2011, Lalita Singh and Nemlal Paswan were convicted of Uma’s murder and sentenced to life in prison. Lalita Singh, sister-in-law of Uma, was one of the key conspirators of the murder. Nemlal Paswan was a known criminal in the province and several arrest warrants at the time of the murder against him. Swamiji, Yadav’s alias, evaded arrest for a number of years following the murder, believed to have gone into India in hiding. More here. The circular, issued by the directorate of information and publicity department, states that if the government find news items to be defamatory it will launch criminal defamation proceedings. The move came a few days after the Delhi government issued an order for close monitoring of all news channels. However, the circular was stayed by the Supreme Court of Delhi that asked Chief Minister Arvind Kejriwal to explain why “such circular” was issued within six weeks and listed the matter for further hearing on July 8. More here. Human rights activists Dr Nirmal Ranjith Devasiri and Dr Kumudu Kusum Kumara were attacked in May Day rallies at the Kirullapona Lalith Athulathmudali in the capital Colombo on May 1. Both activists were attacked when the pro-Rajapaksa supporters recognised them, claiming that they were responsible for Rajapaksa’s loss in the presidential elections in January. According to reports, police offered protection to Dr Devasiri and Dr Kumara, escorting them from the rallies. The police were also allegedly targeted in the violence. More here. The Sirisena administration’s desire to improve the press freedom situation in Sri Lanka seems genuine. But in Sri Lanka, as everywhere, reforms can stall and priorities shift. The government has a tremendous window of opportunity now to dispense with the past and forge a new relationship with media – one based on respect for the rule of law and the media’s role in democratic society. As time goes by, that window will become narrower and the latent mistrust among journalists will start to calcify. For its part, the international community will need to keep its own eyes open and not let up pressure. Blog by Scott Griffin (IPI) read it here. On a chilly evening Parvaz Mohammad Sultan was giving final touches to his daily bulletin when two unidentified gunmen entered his press enclave office and fired at him from point blank. Left in a pool of blood, the 40-year-old editor of local news gathering agency News and Feature Alliance (NAFA), was shifted to hospital but he lost the battle with his life on the way. Parvaz was not the first journalist killed during the conflict in Jammu and Kashmir, but he left a trail of misery behind him with a young wife and three small children. Blog by Shujaat Bukhari read it here. Most of HRDs and journalists who had gone into exile have suffered terribly – before they went and after being exiled. Their families have suffered. They had to give up a lot. They deserve respect and understanding for their decisions to stay away or return. If and when they want to return, they should be supported morally, politically and financially, considering specific needs and whether the return is permanent or temporary. The Sri Lankan government must take the lead role in this. Blog by Ruki Fernando read it here. Read an interview with Moanlisa Changkijia, Nagaland’s only female editor here. Blog by Prasanta Chakraborty, read it here. The IFJ joined its Asia-Pacific affiliates in calling for the immediate release of imprisoned veteran Chinese journalist Gao Yu ahead of World Press Freedom Day on Sunday, May 3. Media unions and associations representing the South Asia Media Solidarity Network (SAMSN) joined others in writing to the Chinese authorities highlighting the inconsistencies in Gao Yu’s arrest and her recent trial and sentencing and have urged China’s President to use his power to release the journalist. The imprisonment of the 71-year-old independent journalist for revealing a state secret has drawn global criticism to her case as well as the plight of at least 43 other journalists currently in jail. Gao Yu was arrested in Beijing on April 24, 2014, on charges of illegally obtaining state secrets and sharing them with foreign media. Gao Yu is suffering from ill health and has twice previously been imprisoned for her journalism, in 1989 and 1993. More here. Bhutan Media Foundation has published the second edition of the Bhutanese Journalism Review, which can be downloaded here. 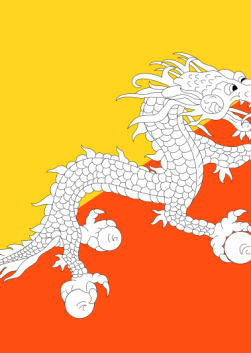 The Journalists Association of Bhutan (JAB) has announced the Journalism Grant that will be awarded to the best Proposal on Print, Investigative Story, News Documentary, or Radio Documentary. With this Grant JAB aims to encourage reporters to cover stories that will make meaningful contribution to the society. Deadline: May 19, details here.